The shaded areas are the attenance boundries for students who will attend Emerson and Longfellow Schools for the 2019-20 school year. SIDNEY — Sidney City Schools parents and students are hearing a new voice when a school delay or cancellation is received via their phone. “Ranger Bob” aka Sidney Superintendent Bob Humble, has reported for duty. “I started Ranger Bob during he 2008-09 school year when I started as the new superintendent for Fairbanks Schools,” said Humble. “We had tons of school delays because of straight line winds and fog. It was a bad winter that year. The Ranger Bob character is based on one created by Gary Burbank, a disc jockey at WLW in Cincinnati who Humble listened to when he was growing up. “His messages evolved into my Ranger Bob,” said Humble. “At Christmas, Santa Bob takes over. Humble has adjusted his Ranger Bob school notices so the delay or cancellation is read first and then Ranger Bob takes over the phone call. A special guest has also visited Ranger Bob. SIDNEY — The process for configuring the elementary schools for Sidney City Schools is proceeding. The adoption of the 2019-20 school calendar, said Humble, is allowing the district to have more time over the summer to complete the moves. The first day of school will be after Labor Day. The district added 30 minutes onto each school day to allow for the later start of the school year and still have the last day of school in May. • Sidney Middle School, all fifth-grade students in addition to grades six to eight. “The majority of teachers going to preschool are super excited,” said Tiffany Rank, SCS communications coordinator. “We had a scheduled meeting on Jan. 25 for a meet and greet at the new building for the principal and staff,” said Brooke Gessler, director of curriculum. The need for the restructuring of the district buildings is a result of declining enrollment, said Humble. A committee, said Mike Watkins, treasurer, meets every Friday to discuss the reconfiguration process and to make sure all the i’s are dotted and t’s are crossed in preparation for the new school year. “We talk about what’s happened that week and what will happen during the upcoming week,” said Watkins. District officials are planning for purchases for the new preschool program, said Humble. New playground equipment appropriate for special needs and typical preschool students will be installed at Whittier. The playground equipment at Whittier will be moved to Sidney Middle School for the fifth- and sixth-graders to use during recess. Beth Abbott, who is currently an MH teacher in the district, is the new coordinator for the preschool program. Her title is student services coordinator. For the remainder of the school year, she will be housed at the board of education building; for the new school year, she will be based out of Whittier Elementary School. The preschool program will be operated four days a week, the same as it is now at Shelby Hills. There will be two sessions a day with each session lasting 3 hours and 15 minutes. “We’re going to mirror for typical student costs of what Shelby Hills is doing now,” said Humble. Registration for the fall will begin in March with registration forms available on March 11 at the BOE office and online. Sidney officials are estimating 100 students attending the preschool program. Special needs students begin classes on their third birthdays and attend until they age out at five years old and are eligible for kindergarten. Humble said because a child may turn 3 during the school year — and is eligible for the preschool program — some spots in the classes will be left open for the child to join mid-school year. There will be 11 preschool classes at Whittier. A “One Call” has been sent to parents for transportation information for the new school year. “We think more people will be eligible to be transported to school,” said Humble. “Once we get start times for the buildings, open houses set, we’ll know the transportation needs better. A parent calendar will be available within the next two weeks. Because of the reconfiguration of the district, no teachers had to be laid off. “We’re better able to utilize our staff,” said Humble of the changes for next year. One aide, he said, will be used as a substitute bus driveer. Watkins said the changes will help the district’s financial future. Gessler said she’s excited about expanding the educational opportunities for the teachers and students in the district. Questions about the reconfiguration can be emailed to questions@sidneycityschools.org. “We will continue to respond to the questions emailed to us,” said Gessler. 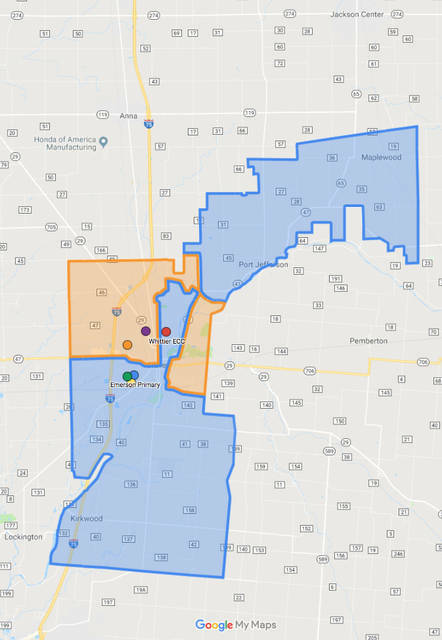 https://www.sidneydailynews.com/wp-content/uploads/sites/47/2019/02/web1_Walkingroutes.jpgThe shaded areas are the attenance boundries for students who will attend Emerson and Longfellow Schools for the 2019-20 school year.